The Sun bear is the smallest of the eight bear species in the world. Its name is derived from the white to yellowish crescent markings on its chest which look like a setting or rising sun. 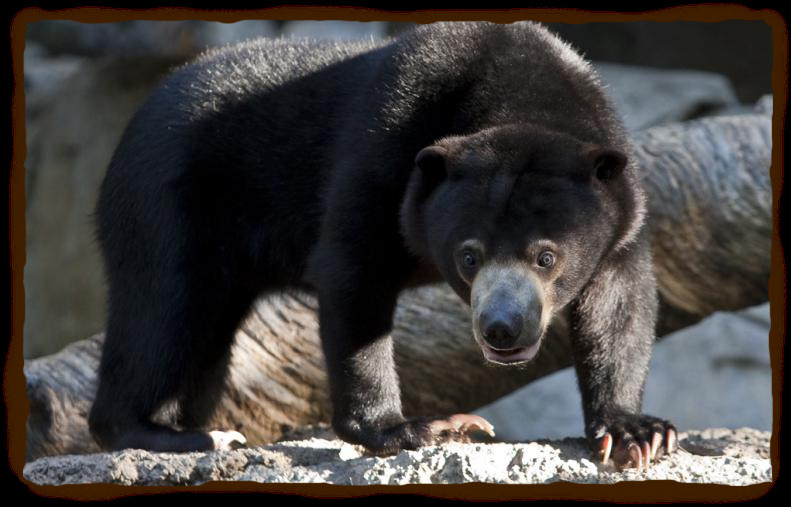 Sun bear live in the tropical countries of Asia and because of the hot climate, they do not hibernate like other bears. Despite this, sun bears have thick and dense fur to protect them from sharp twigs and braches in the forest and also from heavy rain. They have sharp claws which they keep charpen by scratching on tree trunks. These claw markings are often the first indication on their presence in the rainforest. 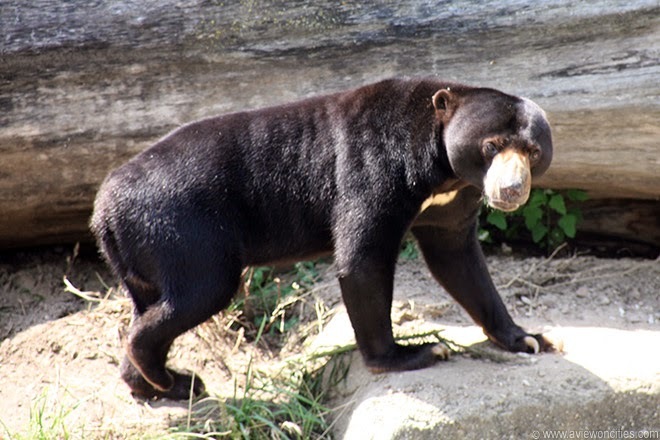 Sun bears have large paws with hairless soles which help them climb trees and move high up in the branches. They are nocturnal and arboreal creatures and spend the mornings sunbathing or relaxing on these tree branches. They build nest on the ground or in hollow tree trunks where the female would give birth to hairless cubs that are enable to hear or smell. These cubs will depend on their mother completely until about four months old. They will, however, stay with their mother for up to two years. Their diet varies widely and includes small vertebrates, such as lizards, birds, and other mammals, in addition to fruits, egges, termites, the young tips of palm trees, nests of bees, berries, sprouts, insects, roots, cocoa, and coconuts. Their secretive nature makes the sun bear difficulty to study in the wild but we do know that their numbers are depleting due to habitat toss, proaching and the illegal pet trade.